A pocket-sized collection of mindfulness practices anyone can do anytime--from the author of Mindful Eating. Mindfulness can reduce stress, improve physical health and quality of life, and give you deep insight. Meditation practice is one way to do it, but not the only way. In fact, there are easy ways to fit it into your everyday life. 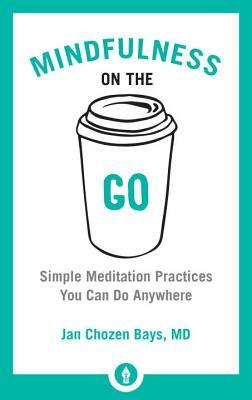 Jan Chozen Bays provides here 25 practices that can be used on the go to cultivate mindfulness. The three-breath practice, the mindfulness of entering rooms, offering compliments, tasting your food one careful bite at a time--these deceptively simple practices can have a cumulative effect for the better. The book is an abridgment of Bays's longer collection How to Train a Wild Elephant: And Other Adventures in Mindfulness. JAN CHOZEN BAYS, MD, is a Zen master in the White Plum lineage of the late master Taizan Maezumi Roshi. She serves as a priest and teacher at the Jizo Mountain-Great Vow Zen Monastery in Clatskanie, Oregon. She is also a pediatrician who specializes in the evaluation of children for abuse and neglect.